Since the Great Glen Way was opened in 2002 many walkers have stopped at Fiddler's for refreshment and sustenance and also as a base to discuss their trek with fellow walkers. Our wide and varied menu is sure to please all tastes and our beer and whisky menus offer an unbeatable selection of Scottish ales and whiskies to help our Great Glen walkers relax after the days exertions. 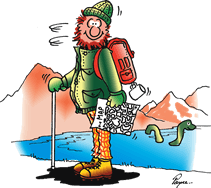 Great Glen Way accommodation - why walk any further? You've walked all day, you're tired and after you've checked in to your room and relaxed the last thing you need is to walk or organise and pay for transport to get your dinner. Ideally you want accommodation as near to the bar/restaurant as possible. We have seven rooms at Fiddler's - please go to our accommodation page for more info. Here at Fiddler's we can accommodate groups of up to seventeen walkers - each of our seven rooms can accommodate two guests and we have extra fold out beds in three of our rooms which are suitable for small adults or children. Our position is ideal for your group as we are centrally located on the village green in the centre of the village right on the Great Glen Way. Your group members can use Fiddler's as a natural rendezvous point and can enjoy a cool beer or refreshing coffee before or after they check-in to their rooms. If your group is more than seventeen we can even organize accommodation for the members of your group that we can't. You can also pre-book a table for dinner to ensure that you are all seated together and have the minimum of waiting. The Great Glen Way is 73 miles/117km in length. It runs from Fort William, in the west, to Inverness, in the east, with spectacular views and historical and natural heritage to be discovered all along the way. The route can be walked in 4-6 days, staying overnight in the various communities within the glen, and suits all levels of walker. For the less experienced it is the perfect introduction to long distance walking, being for the most part low-level and following mainly towpaths and woodland tracks. There are some challenging sections though, and the more experienced may wish to tackle a few munros or corbetts within reach from the route. The route can be walked in either direction, however, walking from Fort William to Inverness you have the prevailing wind behind you and begin with the easier sections of the way.